Clover and Gab Biland at State Championships, 2011. Born December 2004, out of Toddingham(Imp) and by Visage(Imp), Clover was started late February, 2008. She is a flash mover with a competitive edge, like her mum, and full sister to Vigil and Venice. Now owned by the Biland family, Clover is continuing in training at Copabella with Gab who notched up several successes in Interschools competition in dressage as well as showjumping in 2010. In 2011, Gab is spending her gap year as a working student at Copabella, enabling her to get Clover out and about considerably more, and with regular successes in showjumping and eventing. 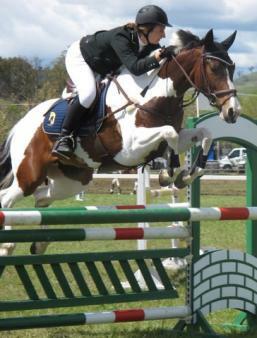 Before Gab took over, Clover had been in training with Brooke Campbell, and the pair began turning heads as soon as they went out, first at Northside Showjumping, and then Gunnedah Showjumping Festival in July 09. They also attended Gunnedah Show in June, scoring 72% in their first ever dressage test in the Combined Training class. In November 2009, Brooke and Clover won the 1.00m Equitation class at the Championships at SIEC, and placed 3rd in the 1.05cm Hunter Jumper class. And on the Victorian run later in the year, the pair featured in the finals of most of the D Grade classes and championships.